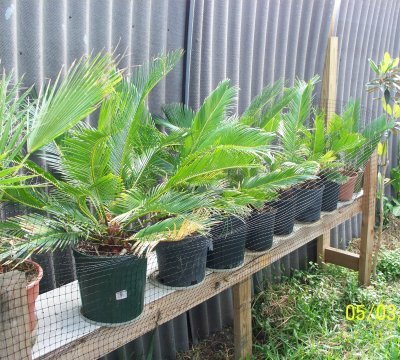 If you're reading this, this you probably know about Sago palms. It's not a palm, it's a cycad. Water in the warm months is good, and they seem to respond especially well to organic fertilizers. In fact, keeping everything organic for Sagos always yields the best results. Sagos in south Texas are starting to fall prey to scale insects, but I haven't run across them yet, nor anything else that likes to eat them. The damage you see here was caused by overcrowding...it's doing fine now. 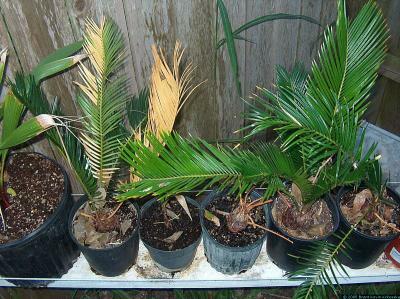 Keeping them in smaller pots, one gallon pots in this case, keeps the plant small. I have others from this same batch of seed that I've bumped up to three gallon pots and the difference in size is very noticeable.